A week before Christmas I journeyed to the Black Hills of South Dakota to get winter footage for our new film being produced for Little Bighorn Battlefield National Monument. Only on this day, the weather was not cooperating. While the rest of the nation is being clobbered by snow, it looks like summer in the Black Hills. Though the temperature hovered around zero, the sun shone brightly with no snow on the ground. My hope was to get gloomy winter shots to help convey the Lakota’s sacred Black Hills being seized by the US government in 1876. It wasn’t looking good. My plan was to drive along the Needles Highway, a Scenic Byway in the Black Hills that goes through stunning rock formations. I arrived at 8am only to see a gate closed across the highway. A worker told me the highway was closed due to helicopter logging in the area. You have got to be kidding. I drove up an old logging road looking for vistas, but found none. Logging roads usually lead to nowhere. I should have known better. But it was then that my luck began to turn. I turned at Highway 244 towards Mt. Rushmore. Across from the monument is a beautiful view of the Black Hills. It didn’t look like winter, but about 20 miles in the distance, I could see a band of thick fog surrounding the Hills. I descended the vista and in a matter of minutes, the landscape was magically transformed. The fog had frozen onto the trees and grasses, creating a frosty landscape that seemed to be frozen in time. Everything was coated in a spectacular coating of ice. I kept thinking of “the Moon of Popping Trees,” a way the Lakotas describe the cold winter period of December. I traveled through the Black Hills, lands the Lakotas call Paha Sapa. In 1874 gold was discovered in these sacred lands. The discovery ignited a dramatic chain of events that would lead to the Battle of Little Bighorn two years later. I stopped to get shots, and continued on, looking for buffalo. I saw none but came about something better. Stopping in Wind Cave National Park, I noticed a large bird atop a cottonwood tree about a quarter mile away. I knew right away it was a bald eagle. 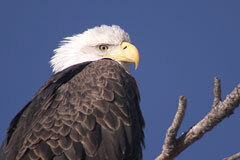 Bald eagles can be very difficult to film – they are very sensitive to human presence. Two days earlier in Wyoming, I stopped to get a shot of one ¼ mile away, only to have him fly away as I was putting the camera on the tripod. I slowly and quietly extended the tripod, locked the camera on and began filming. Although far way, I was able to get a decent shot. I decided to push my luck and edge further about 50 yards. The eagle stayed put. Again, I edged further. The eagle did not fly away. Before I knew it, I was standing right next to the tree, getting fantastic close-ups. The eagle was one of the most beautiful raptors I have ever seen. His head was bright white, while the rest of his body was covered with a thick coat of jet-black winter feathers. I was so close, you could see the pupils of his eyes as he scanned the landscape. At a couple of points, he looked directly into my lens.